I’ve been thinking about shoes lately. I love a good well-made pair of casual shoes because when you find the right pair, you seem to wear them constantly. I’m a big believer that shoes are an investment for our wardrobe and long term health, but having great shoes is knowing how to keep them clean and fresh- and looking fabulous! 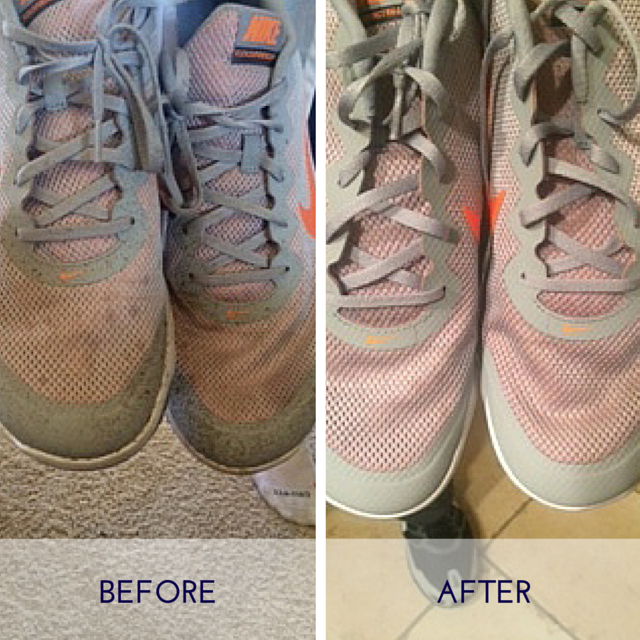 Not a very scientific cleaning process but it worked like a charm and the tennis shoes came out of the washer devoid of the mystery stains! I got extra brownie points with my friend, and was surprised to find that the simple cleaning tip of using soap and water worked so well! Wash the sockliner or insole separately if you’re able to remove them. This will help make the inside of your shoe fresher. Laces can be washed or just replaced. Remove surface dirt such as mud and grit. Use an old toothbrush or nail brush, a little warm water and a gentle, anti-grease soap. This should take care of the dirt, and is fine to do once in awhile. I don't recommend soaking the shoe for lighter cleaning jobs. Dry your shoes naturally and don’t place them near a radiator. Direct heat will alter the shape of the shoe. Open out the shoe and then stuff the inside with kitchen paper or newspaper. The paper will absorb the dampness inside the shoe. A shoe takes about twelve hours to dry out. Did you forget to drop off the dry cleaning or need to freshen a suit or dress that picked up the smell of smoke after an evening out? What can you do? Using your home bar, or if traveling, the hotel mini-bar, D.I.Y. a quick odor eliminating fabric spray! The same mix works for removing pet odor on upholstery and more. Here is another one of my "Oh Sh#%" tips! Have you ever been sitting at work in a favorite shirt or blouse and suddenly realize you have ink on your sleeve? Or perhaps you have caught your kids writing on your car's upholstery? You grab something you already have on hand! Follow these quick and easy instructions and be back to looking fabulous in no time at all!